With a few simple ingredients try this delicious recipe with our lighter variant, light Condensed Milk. 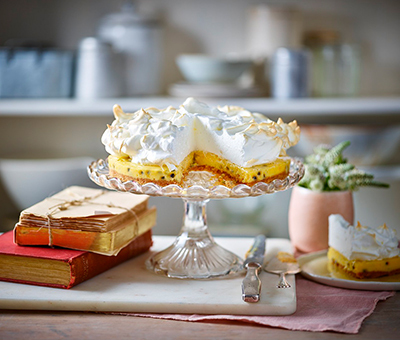 This recipe will be ideal for the summer with freshness of the passionfruit. Put the crushed biscuit into a bowl with the melted buttery baking spread. Mix it together thoroughly, mix well, then press the mixture into the base of your tin. Chill for 10ten minutes. Preheat the oven to 180°C, (160°C fan ovens), Gas Mark 4. Whisk the egg yolks and the condensed milk together, then stir in the lime juice and passion fruit pulp. Pour the mixture over the biscuit base and bake for 10-15 minutes until set. Leave to cool then carefully remove from the tin and transfer the pie onto a baking sheet. With a clean whisk, beat the egg whites to stiff peaks then slowly whisk in the caster sugar until glossy and thick. Pile the meringue onto the pie and spread out, making peaks as you go. Bake for a further 5-6 minutes until the peaks are lightly browned and the meringue has set. Leave to cool slightly before serving. *recipe is based on 70% fat buttery baking spread.